The Royal Cork mixed dinghies class enjoyed a three day coaching camp at the club over the Easter holidays. The weather was quite kind to the group with some great sailing on all three days even if it was a touch cold and breezy at times! The conditions were quite testing and the nature of this group of sailors meant there is a big spread of ability from top to bottom. However all the sailors coped well with the conditions and enjoyed expert coaching from Tom McGrath, James McCann and Harry Whitaker. Under the watchful eye of the newly elected class captain Fiona Young, it was decided to hold the majority of the sailing in the protected waters of the river, with only one or two hardy sailors venturing out onto the bank for some capsize practice! 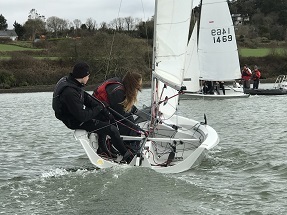 The tide was high and the sailors enjoyed the shifty conditions and the safety of the river sailing, it also made great viewing from the club house or marina. The coaching was short and sweet and each day ran from 9.30 to 1.30 so the concentration levels were high for the duration of each session. An after sailing de-briefing was held by the coaches in the cadet room to discuss elements of the days sailing and addressing area’s for improvement. Hot chocolate featured highly on the after sailing menu and it was great to see so many smiling faces in the club after it was all over.